Come out and join us for the 8th annual 2018 Run Run Reindeer Family Fun Run. Start Time: December 22nd, 2018 – Starts at 9 a.m.
Come out to the 8th Annual Run Run Reindeer 5k Family Fun Run and join in the Holiday Season Festivities. 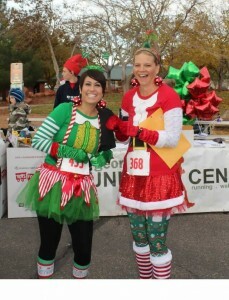 With Christmas Music on the course and Run Run Reindeer Selfie Stations, you’ll be able to celebrate and run at the same time! 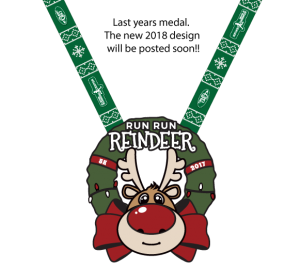 Every participant will receive a Run Run Reindeer t-shirt and an AMAZING 4″ Run Run Reindeer Finisher medal. The first 500 people to register will receive foam reindeer antlers as well. The race is not timed, but we will be providing prizes for the first 3 Male and Female Finishers from the St. George Running Center & Runway Fashion Exchange. This is the Christmas Fun Jackpot! PRIZES & GIVEAWAYS: Stick around for prizes, giveaways, hot chocolate, donuts from Lins, Muffins from Smiths, and more holiday cheer! We also, will also be giving 4 runners with the most festive outfits $25 gift cards towards anything at the St. George Running Center. Also, again this year – The Most Ugly Sweater Award –wins a $50 gift card!! Other random prizes from our sponsors!! If you would like (not required) bring an unopened, new toy to benefit Toys for Tots!! Last year your toys benefited over 300 youngsters in need of Christmas cheer! Also, $2 from every race entry will be going to Toys for Tots as well! Packet pickup will be Friday from 2pm-7pm at the St. George Running Center and 8:00am-8:45am on Saturday morning before the race.